Nescafé Italia is promoting the role of coffee in building relationships, with the “Nescafé Hello Bench, a specially designed red bench. Creating new relationships it’s harder than we think, even when we are in the midst of hundreds of thousands of people. To do so, we need a spark, a new opportunity and, of course, a red mug. 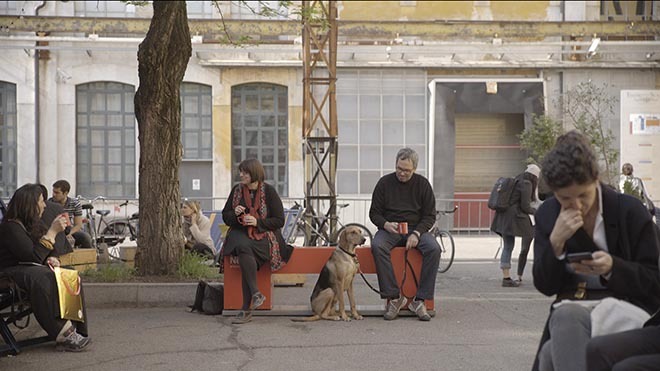 During the Salone del Mobile in Milan pedestrians were offered a cup of coffee and a chant to sit on the Nescafé Hello Bench, a bench that gets shorter when two people sit on it. Two sensors activate the bench and let two strangers get closer: an unexpected way to break the ice and start a conversation and a connection. The Nescafe Hello Bench campaign was developed at Publicis Italy by global Chief Creative Officer Bruno Bertelli, executive creative director Cristiana Boccassini, art directors Alessandro Candito, Maxime Damo, copywriters Lina Akbarzadeh, Paolo Bartalucci, creative directors Alessandro Candito, Paolo Bartalucci, Geert De Rocker, Tom Berth, digital creative directors Azeglio Bozzardi, Martino Lapini, social media team Diletta Sala and Arya Alfieri, strategic planner Guglielmo Pezzino, TV producers Luana Strafile and Matilde Bonanni, account team Barbara Pusca, Filippo D’Andrea, Florence De Lophem and Roberta Scotti, working with marketing manager Matteo Cattaneo. Filming was shot by director Murphy via H+ with executive producer Stella Orsini.